You can find everything you need to know about payments in the My account tab. The account summary section will show you how many seats you bought for your Dashlane business account. 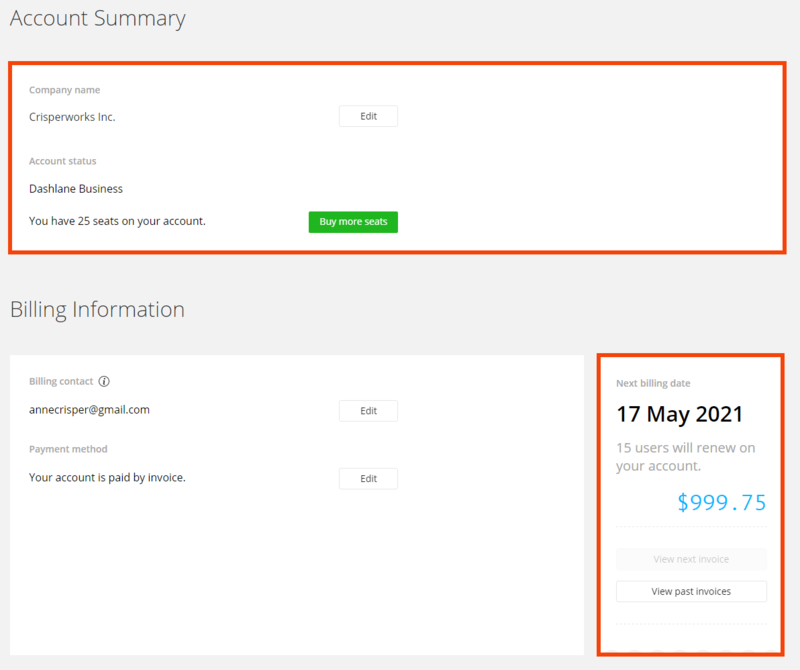 In the bottom-right corner of this page, you can generate invoices for your plan. When are Business accounts renewed? Dashlane licenses are renewed annually. The billing date is indicated at the bottom right corner of your Manage users tab, above your next and past invoices. The renewal date matches the anniversary of your Dashlane Business account creation. What happens if I add more seats before the end of my billing period? If you purchase extra seats while your billing period is ongoing, you will be billed proportionally to the number of days that remain until your next renewal. On renewal day, will I be billed for each empty seat in my Dashlane Business account? Yes. You are renewed at the full seat count. If you would like to remove seats from your Dashlane Business account, please have your team admin contact us before your renewal date to prevent any unwanted charges.